What is Eduspace?What tools does it offer? Earth Observation satellites vary according to the type of orbit they have, the payload they carry, and, from the point of view of imaging instruments, the spatial resolution, spectral characteristics and swath width of the sensors. All these parameters are designed at the beginning of the mission definition depending on the application the satellite mission is targeting. In order to monitor the weather at large scales and high frequency, it is convenient for a satellite to be in a geostationary orbit. In such an orbit a satellite is able to continuously view almost an entire hemisphere. However, as the orbit is very high (approximately 36 000 km above the Earth) a high spatial resolution is difficult to attain. But for such applications as the tracking of clouds over continents, a high spatial resolution is not necessary. For applications requiring high resolution imaging of a very specific area, such as the monitoring of a glacier lake, or the mapping of buildings destroyed by an earthquake, a high resolution sensor would be required. Such a sensor would generally have a narrow swath and be on a satellite at Low Earth Orbit, called LEO (such as 600 km above the Earth in the case of the QuickBird satellite). In such an orbit it is not possible to continuously monitor the same area, because of the relative movement of the satellite with respect to the Earth. Images can only be acquired over a given area when the satellite passes over it. 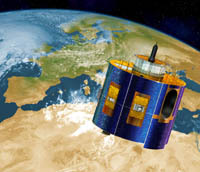 In this section, some principal Earth Observation satellite missions are presented. For each mission, information is given about the satellite orbit, payload and Earth Observation applications for which they were intended.